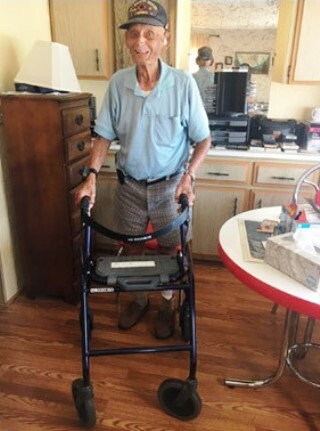 POLK COUNTY -- People from across the country are chipping in to help out World War II veteran Chet Lebrun, who earlier this month was facing eviction from his Cypress Shores mobile home community. On Feb. 8 Cypress Shores sent Lebrun a violation notice, telling him he had to fix his Hurricane Irma damage as well as power wash his home and get the weeds out of his flower bed, or he’d face the consequences up to eviction. When his caretaker and power of attorney Karen Bingham expressed her outrage on Facebook on February 15, people started asking how they could help. His story spread through social media and media outlets across the region, including Bay News 9. His GoFundMe account has since surpassed its goal of $20,000. Bingham got choked up, thinking about the outpouring of support for Lebrun, who she considers a second dad. “It just restores your hope in humanity, you know," Bingham said. "He deserves every single bit of help and support and prayers and love that he’s receiving. I’m just humbled to be a part of it to help him." Bingham said two businessmen who wished to remain anonymous called her Monday, offering to buy Lebrun a $12,000 mobile home in “The Hamptons," a mobile home community just down the road in Auburndale. This community has a restaurant, golf course, and pool onsite. Bingham was shocked by the kind gesture and she said Lebrun is still surprised. “I’d like to meet them and thank them, you know,” Lebrun said. “He said to me yesterday, 'I’m just a nobody. I’m just like everybody else. I can’t believe this. I can’t believe this,'” Bingham recalled. Bingham said he won’t have to ever worry again about getting another violation notice threatening eviction. The donations will take care of all of his home maintenance costs and fees, as well as lot rent for at least a year. Lucien "Chet" Lebrun in his home at the Cypress Shores mobile home park. Soon Lebrun will be moving to a new home, thanks to the help of generous donors who learned he was facing eviction. “As long as he lives now, he’s never going to have to worry about his finances again, which is beautiful,” Bingham said. Some students from Summerlin Academy are volunteering to help Lebrun pack. The plan is to move him out of his current home sometime after March 4. The safety and well being of our residents is our top priority. The resident in question was not going to be evicted on February 23. We were following the protocols and procedures set forth in the rental agreement the resident signed and in accordance with Florida statute. We have been sending notices respectfully asking that repairs be made to his home and for the resident’s safety and the safety of others, we also have been in discussions with the resident and the individual responsible for his care about possibly moving to another home within the community.